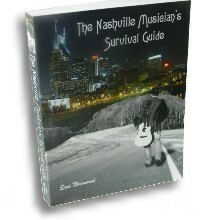 The Nashville Musician's Survival Guide is available as a soft cover book and in ebook and Kindle versions. Also available are Eric's original insturmental CD "Songs Without Words" and his latest 5 song EP with his band Skinny Buddha. NEW - Skype Sessions, connect with Eric one-on-one! As of May 1, 2018 we will be shipping to U.S. addresses only. Soft cover edition. 396 pages. Ebook or Kindle version. Download instantly.. Choose from the instrumental "Songs Without Words" or the newest "Skinny Buddha"
Connect with Eric one-on-one via Skype! This book is a street-level perspective of the inner workings of the Nashville music industry and provides insight to both beginners and professionals. This site is also home to my blog which contains over 100 articles on everything from touring life to tinnitus, gigging in Nashville to the Great Flood of 2010, bus driver horror stories to frat parties, and much more.